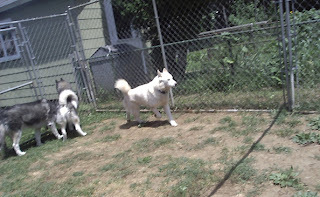 Thunder is a beautiful 9 year old white, blue eyed male Siberian Husky. His owner's husband passed away and she had to move in with her son, and could not take her dogs with her. So Thunder came into one of our foster homes. Here he is playing with his foster siblings. It's good to see him having fun, he was a little down when he first came in to foster care. Way to go Thunder! Congratulations on getting over $2,000 in this year's blogathon - I'm blogging for the ASPCA, and only have $55 in pledges, but I'm aiming for that $2,000 lol I'm so glad you got so many wonderful donations to help out your cause!! 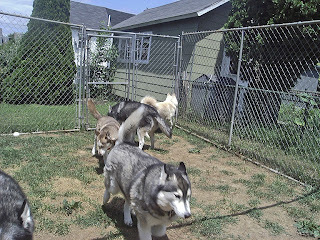 I LOVE Huskies and Malamutes - I've wanted one for a very long time now but they are not a breed that is very available locally here in Missouri. 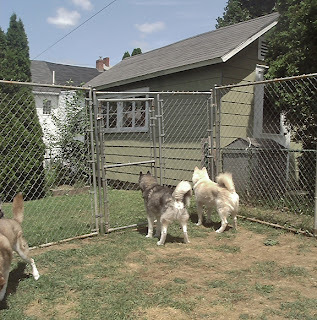 We searched shelters and rescue organizations here for months and couldn't find one! What gorgeous pictures and videos you have of your doggies! Oh, all of them look like they are having a blast! I am glad Thunder is in HTH foster care and is getting some good loving! Yea, Thunder! Welcome to the white dog foster club dude! 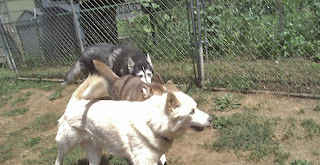 We have some sort of thing for white huskies at our house, but we are happy for all dogs who get help thru rescue. HTH is a great group and you are one gorgeous & lucky pup. Thanks for visiting! I will send your blog to my friend who runs our dog rescue we formed after Hurricane Katrina, Tara's Babies (www.tarasbabies.org).